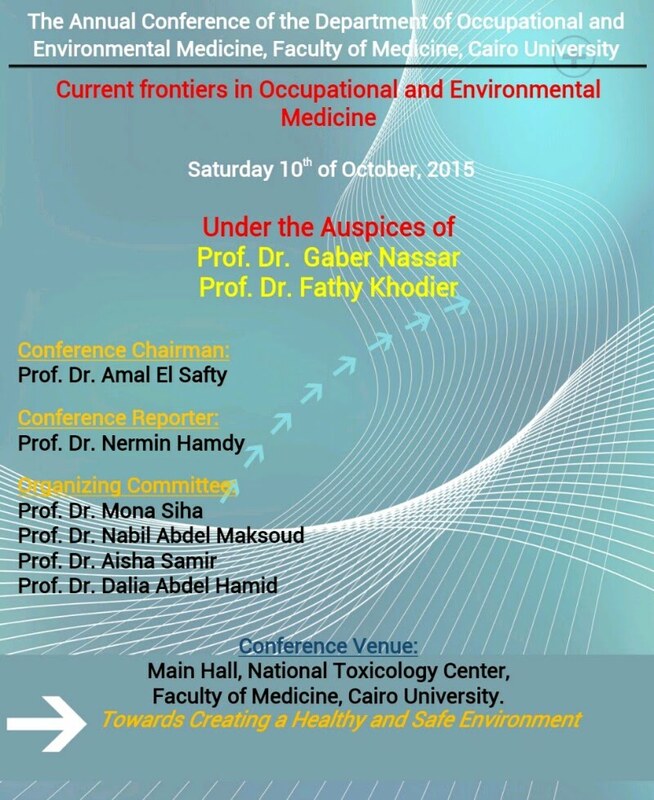 The Department of Occupational and Environmental Medicine (OEM), Faculty of Medicine - Cairo University held its annual conference on the 10th of October, 2015 at the main hall of the National Toxicology Center, Kasr Alainy under the auspices of Prof. Dr. Gaber Nassar and Prof. Dr. Fathy Khodier and witnessed the participation of many of OEM faculty, staff and professionals from Cairo University, other universities and research institutes across the country. The conference was held under the theme "Current Frontiers in Occupational and Environmental Medicine" and included rich presentations and discussion of several emerging and urgent national occupational and environmental health issues e.g. health and environmental risks of the use of different sources of fuel in energy production, water pollution, household toxicants, etc. 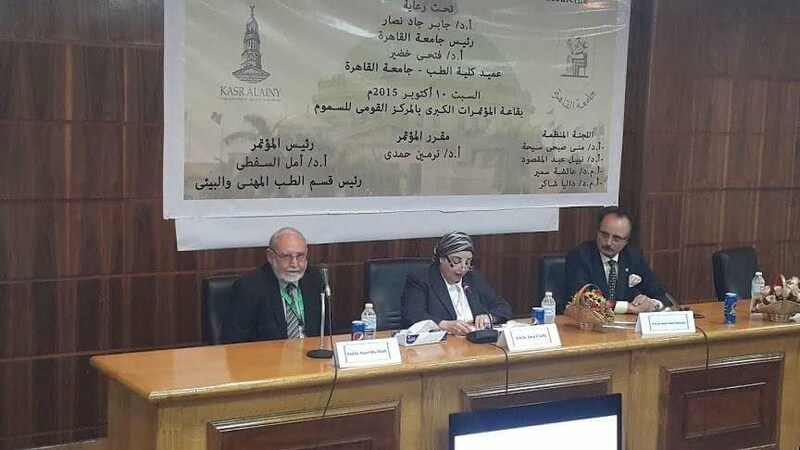 The Department of Occupational and Environmental Medicine held an Honoring Ceremony for Dr. Hussein Khairy, the Ex-Dean of the Faculty of Medicine - Cairo University, in recognition of the great efforts and dedication he paid to Kasr Alainy during the years of deanship and all long his career. The ceremony started by a welcoming word said by Dr. Amal El Safty, the Head of the Department, after which Dr. Hussein Khairy was asked to give a short speech. All department faculty and staff wished Dr. Hussein Khairy all the best in the coming years and the Ceremony was concluded by taking memorial photographs with the department staff. 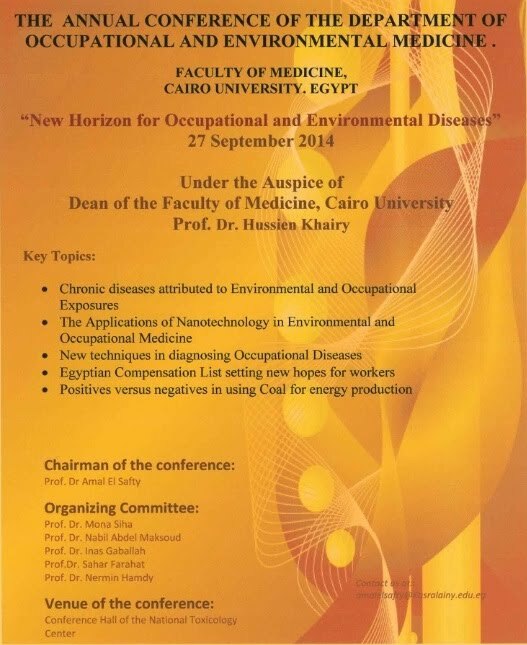 The Department of Occupational and Environmental Medicine (OEM), Faculty of Medicine - Cairo University held its annual conference on the 27th of September, 2014 under the theme "New Horizon for the Occupational and Environmental Diseases". The Conference was enriched by the participation of many of the most eminent OEM faculty, staff and professionals from Cairo University and other universities and research institutes across the country. There were two parallel workshops conducted at the end of the day; one to discuss the safety of using Cool in energy production in Egypt and the other discussed the new modifications to the occupational diseases schedule of Egypt. The two workshops were concluded by OEM expert recommendations regarding the discussed topics. It is the pleasure of OEM Department to announce that the thesis submitted by Dr. Aisha Safwat, Assistant Lecturer at OEM Department, has been chosen to be the best thesis submitted for fulfillment of Master Degree (at the level of the Faculty of Medicine, Cairo University) for the year 2011 - 2012. The Department congratulates Dr. Aisha for her accomplishment and encourages her and all other department members to pursue excellence in their research, academic as well as practical work. We are pleased to announce that assessment of workers' exposure to ionizing radiation (e.g. doctors, nurses and technicians at operating theaters) and evaluation of suitable protective equipment are of the services provided by the OEM department. We are pleased to announce that assessment of ventilatory function tests "pre- and post-operative" is available at the department.